Resonant Rogues | Sierra Nevada Brewing Co.
Join us in High Gravity at the Sierra Nevada Taproom in Mills River on Saturday, January 19th from 1pm to 4pm for a free show with the Resonant Rogues. The Resonant Rogues are the songwriting soul child of partners Sparrow and Keith J. Smith. 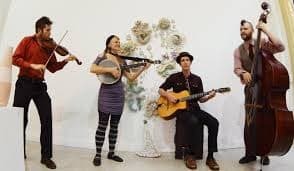 With influences ranging from gypsy swing and early New Orleans jazz, to Appalachian old-time and eastern European folk music, they take their favorite flavors and blend them into a delicious, danceable dish.